The 300B was released in 1956. Starting with this model and ending in 1965 and then re-starting in 1999 with the M series, all models would be labeled with a sequential letter after the initial 1955 300. 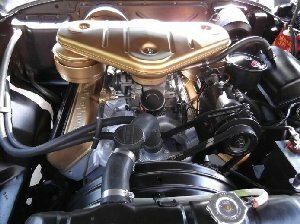 The standard engine was upgraded to a new 354 cid Hemi� V8 with similar features which generated 340 bhp. Optional was a more powerful version with 10:1 compression that produced 355 bhp. 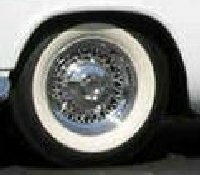 Included with the optional motor was a special three inch exhaust system. 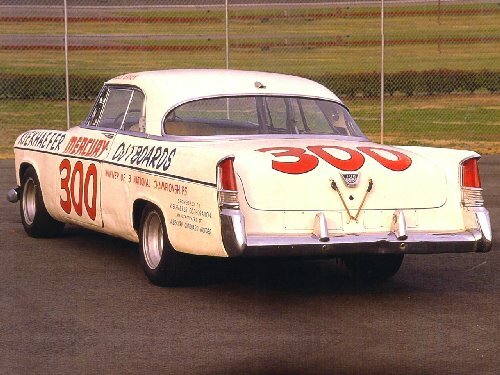 Performance of the new 300B improved as it averaged over 90 mph in the Daytona Grand National and hit almost 140 mph in the Flying Mile. Only 1,102 copies were sold. 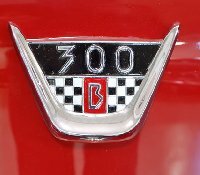 300B SERIES - (8-CYL) - The 300B's styling reflected the same unique flavor that the first letter car introduced in 1955. 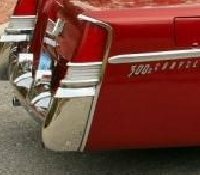 Changes were essentially limited to tail lamp alterations, in line with those appearing on other 1956 Chryslers. The pushbutton control for the Powerflite (later cars had Torqueflite) automatic transmission was positioned to the left side of the dash. Technically a sub-series of the New Yorker, the 300B was available with automatic or standard shift transmissions and two high-performance hemi engines. Leather upholstery was. standard fare. 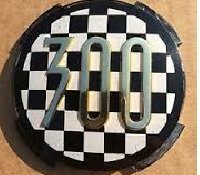 300B I.D. NUMBERS: Production of letter cars took-place exclusively in Detroit, with numbers ranging from 3N56-1001 to 3N56-2150. Engine numbers were 3NE56-1001 to 3NE56-2174. Note 1: Code numbers to provide positive identification of body type were not used. 300B ENGINE - V-8. Overhead valves, High-lift camshaft, Extra stiff valve springs, Cast iron block, Displacement: 354 cubic inches, Bore and stroke:	3.94 x 3.36 inches, Brake horsepower: 340 at 5200 R.P.M., With optional 1O:1 compression ratio, brake horsepower became 355 at 5200 R.P.M.). (available on special order on 300B). Last year for front coil springs combined with rear leaf springs.